Kumaraswamy aspires to be become king-maker, but will he have sufficient numbers? While driving down from Bengaluru to Mysuru, you come across a patch of hillocks near Ram Nagar, a place that provided the backdrop for the all-time hit Bollywood movie, Sholay. This was where villain Gabbar Singh, played by inimitable Amjad Khan, delivered that immortal dialogue, “Kitne aadmi the? (How many people were they? )” The dialogue is better remembered for its style of delivery than content. As the Karnataka assembly election scenario hots up, this dialogue is getting resonance in the region, which is poised for a three-way contest. The Congress, the BJP and Janata Dal (Secular) are desperately trying to keep their flock together and motivating their cadre to outdo the others in the poll campaign. In the core Mysuru region, there are 29 assembly segments which are known to be strongholds of either the Congress or the JD(S). Former prime minister HD Deve Gowda belongs to the region and is known to have considerable clout among Vokkaligas of the area. His son and former chief minister HD Kumaraswamy is seen as a potential kingmaker in case of a hung verdict — provided he retains his influence among voters. But will he manage to retain his base? If one travels across the region, it is quite evident that the Congress and the JD(S) are the dominant political forces. For historical reasons, the Congress is still a party that can claim to have a significant following across caste groups. For older generations, Indira Gandhi is still an unforgettable icon and debt to whom is weighing heavily in their mind. And Siddaramaiah despite his failing as chief minister is not proving to be a pushover. Unlike his predecessor like SM Krishna (who ultimately joined the BJP), Siddaramaiah is a full-time politician deeply engrossed into his vocation in his every action round the clock. And since the ascendancy of the BJP, he understood the necessities of cementing his social base by playing inherent contradictions in the society. That is the precise reason why he decided to declare the Lingayat social group as distinct religion other than Hindu. Since Karnataka’s social economy revolves around thousands of maths (religious seats) that command overweening influence on different castes, Siddaramaiah desperately tried to win over maths and caste groups in order to consolidate his political support base and subsume Hindutva. In sociological terms, he attempted to subsume “larger traditions by little traditions” in the state. His move to forge a coalition of ‘AHINDA’ (minorities, OBCs, and dalits) is a sound political strategy that is reminiscent of KHAM in Gujarat or MAJGAR in Uttar Pradesh. In essence, Siddaramaiah borrowed this strategy of social coalition from his socialist background. But at times such a strategy, if pushed too hard, recoils on its originator. As of now, Siddaramaiah has emerged as the most polarising figure in the state, probably comparable to Mulayam Singh Yadav in Uttar Pradesh after the Ayodhya agitation. One can hear across the state the refrain that says, “If Siddaramaiah has his way, he would finish off Hindus as a coherent social entity." No doubt the whisper campaign by the RSS-BJP machinery gives additional fuel to the fire. However, compared to the Siddaramaiah-led Congress, the BJP in the region was a much less significant force given its internal factional feuds. In 2014 and even before, BS Yeddyurappa, the party’s tallest leader, was marginalised thanks to internal bickering led by factions owing allegiance to LK Advani, Sushma Swaraj, and Ananth Kumar. Yeddyurappa floated his own party and reduced the BJP to a completely marginal force. Of course, the BJP’s strategists were sharp enough to appreciate the potential of Yeddyurappa and roped him in as the chief ministerial candidate for the upcoming election. In posters all across the state, he is given more than adequate prominence along with Narendra Modi and Amit Shah to emphasise his numero uno position within the party’s state unit. Given his background as a formidable leader of farmers and his influence on the powerful Lingayats, the BJP is able to put up a stiff resistance to the Congress in nearly a third of the 29 constituencies in the region. But the party that seems to be gripped by the ‘kitne aadmi the’ syndrome is essentially the Kumaraswamy-led JD(S). This region has been regarded as the pocket borough of Gowda’s family. 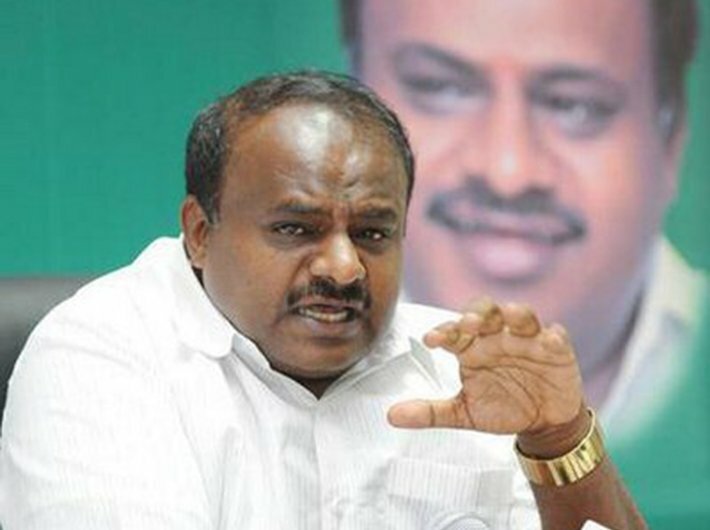 Kumaraswamy claims that legacy, and has been heavily banking on the support of this region to enable him to assume the role of a kingmaker. Significantly, Kumaraswamy is reconciled to the idea of playing the role of a leader who will hold the key to power. And to realise this political aspiration, he would be keen only to retain 30-40 seats that can enable him to see through his plan. But there is a sting in the tail which is again borrowed from Sholay in which the jailer played by Asrani asks his men, “Aadhe idhar jaao, aadhe udhar jaao, baki mere saath aao (half of you go on this side and half on the other side and the rest come with me)”, without realising that he is left with no one. That is the potential risk Kumaraswamy’s strategy may entail.